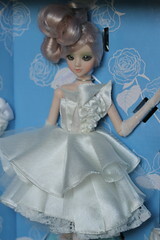 J-dolls are made by Groove (the same company that makes Pullip) and they are dolls that wear fashions inspired by different streets around the world. 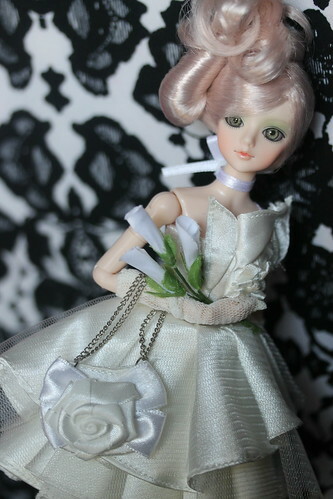 Unlike Pullip who has an over-sized head, J-doll has a normal sized head. 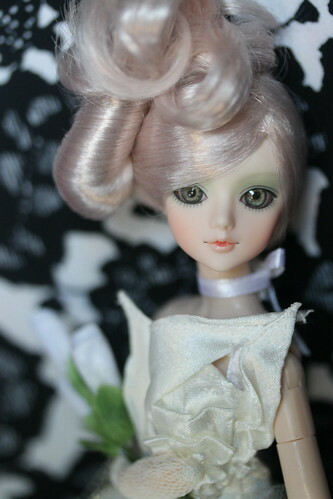 J-doll and Pullip share the same type of body (neck peg is slightly different)- a comparison of Hestia, J-doll and Pullip can be seen- here. After a long break from buying J-doll, I finally decided to add my most wanted J-doll the super elegant Vasterlanggatan to my collection. 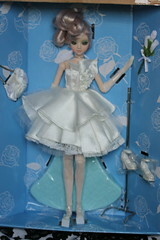 J-doll deboxing, she came a stand, a purse and a bouquet of flowers. The shoes she is wearing a quite popular model for Groove dolls, several Pullips releases also came with these in different colors. Vasterlanggatan’s inspiration was Västerbotten Long, a street in Sweden. She is the absolute picture of elegance from her dress to her beautifully styled updo. 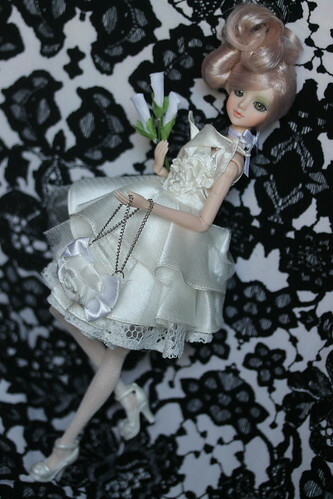 The design of her dress reminds me of somewhat of calla lilies. 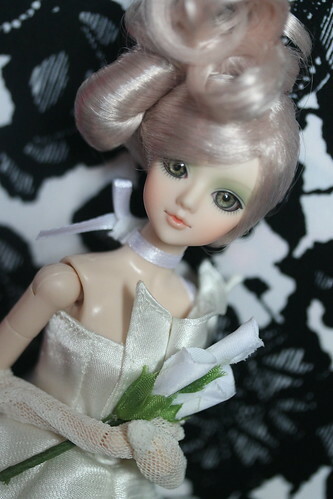 I absolutely love her face up, I would have done a face up shot of her but I was very concerned I would ruin her delicately styled hair if I tried to. 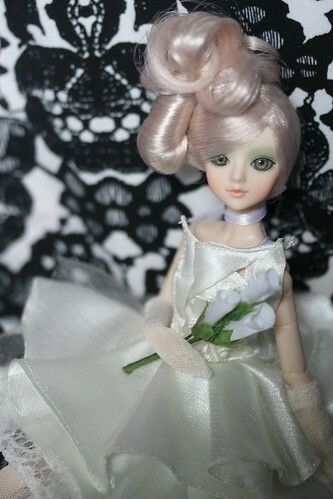 This entry was posted in Doll and tagged groove, j doll, Pullip. Bookmark the permalink. Oh I shouldn’t have read. I think I might have fallen in love with J-dolls now. 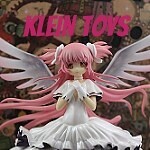 Your model looks really beautiful! Her dress is gorgeous!!! Thanks for all that information! I wonder what’s going on with Ebay. 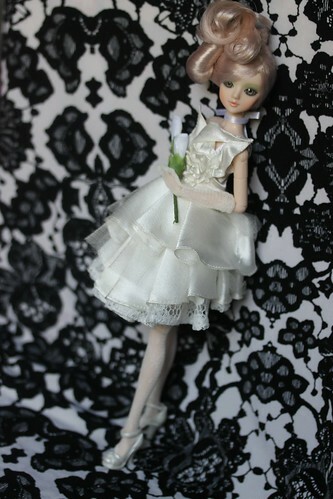 I have also seen quite a few Pullip dolls at low prices recently! But I can’t complain as it makes them more affordable to me! 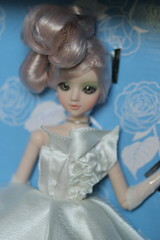 J-dolls have wigs, for the most part their hair can be restyled without too much of an issue. Once the hair is taken though I don’t think it’ll be able to back up the same way so I’m not going to try messing with this one’s hair. I think Vasterlanggatan would make an excellent base for Dany.